Being on social media, for a brand, means more than scheduling posts of the office cat and random company updates. When a brand decides to join the world wide web on a social media platform, they are opening themselves up to the harsh unfiltered thoughts of consumers around the world. Recently, a disturbing video of maggots coming out of a Reese’s Peanut Buttercup has surfaced all over YouTube and even got a hit on popular gossip site World Star Hip Hop. The video consisted of a consumer breaking open her Reese’s only to find live maggots inside of the candy. After searching through YouTube, it appears that multiple consumers have had the same incident occur over the last year. The video has since gone viral and caused a frenzy amongst peanut buttercup lovers who are second guessing their favorite candy. Some have even vowed not to eat the candy ever again! Reese’s have since done damage control on social media by responding to inquiries from consumers in a timely fashion and exemplified a great example of how to respond in a crisis situation. As a small or women owned business, it is inevitable that you will run into mishaps here and there. 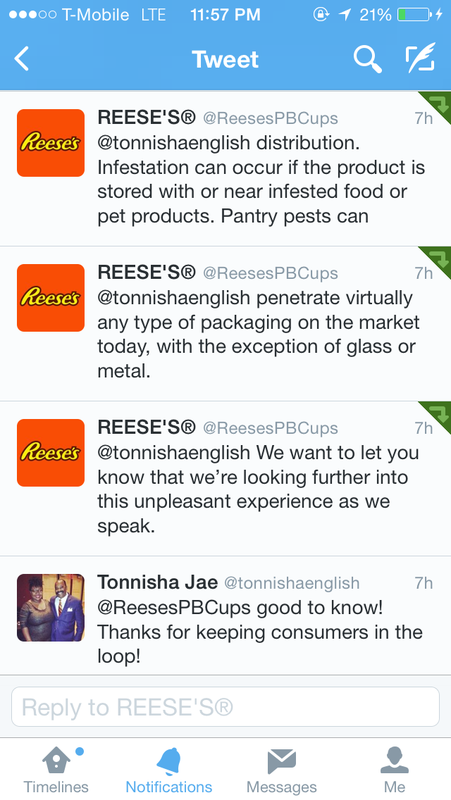 Even the large companies like Reese’s have their hiccups. The worst thing you can do in a situation is ignore your consumers when they are experiencing issues with your product or service. 2. Empathize with the consumer by putting yourself in their shoes. How would you feel if you found maggots embedded in your chocolate? Sure, I will probably not have a Reese’s Cup for quite some time, but I admire their timely responses to consumers and their willingness to make themselves vulnerable by providing the information and working on the next preventative steps. If you were Reese’s, how would you have handled this situation? Is Hershey’s having another maggot crisis? I found a maggot in Hersheys nugget 8/24/2018. Yikes! I haven’t heard anything but I’ll definitely look into it! Wow! Sounds like the problem is happening again! But who knows how many pieces the ate before they discovered them. OMG! I can’t believe this is STILL happening!